A 3D high performance grid structure made of alkali-resistant AR glass has been developed that is exclusive to V. Fraas. Textile reinforcement of concrete using grid structures made of AR glass or carbon is a new and innovative composite material. The great advantage lies in its resistance to corrosion while remaining extremely strong. This makes it possible to install it very close to the underlying surfaces and to produce exceptionally thin and light-weight precast concrete elements or reinforcements. There had always been the problem of how best to join the 3D biaxial reinforcement grids which has now been ingeniously solved at V. Fraas Solutions in Textile GmbH. The 3D high performance grids made of AR glass and carbon are tapered on the ends allowing the grids to be joined by overlapping them which eliminates a thickening at the joint. 3D textile reinforcement of concrete involves a 3D biaxial spacer warp-knit in which two biaxial grids made of alkali-resistant AR glass or carbon are joined by pile fibres into a non-compressible structure. The spacing between the grids as well as the density of the pile fibres can be varied. 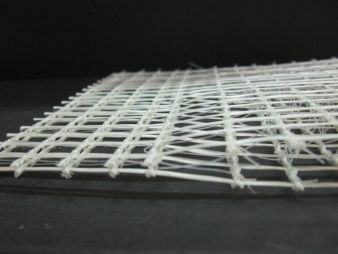 The developer of this innovative textile reinforcement is the V. Fraas Solutions in Textile GmbH with its brand Sitgrid. Sitgrid is available with pile fibres spaced from 5mm up to a maximum of 20mm. V.Fraas Solutions in Textile currently supplies textile reinforcement made of AR glass and carbon for reinforcement and for the precast concrete elements industry. It is available in two dimensional and three dimensional versions in sheets and on rolls. The newest innovation, exclusive to V.Fraas, is the technological solution of the problem of overlapping when joining three dimensional reinforcements made of high performance fibres. The previous method of joining 3D biaxial grids was to position them edge to edge with an overlapping 2D reinforcement above and below. This caused a disadvantageous thickening lengthwise along the overlap as well as an increased use of material due to the need for the 2D reinforcements at the joints. However, the innovative high performance grids from V.Fraas Solutions in Textile are narrower on the left and right edges as the 3D textiles run together towards the edges. In this way the 3D structures can be repeated lengthwise without any thickening of the reinforcement layer at the places where they overlap. The joining of the reinforcement layers over each other in regards to the length of the tapered joints can be varied to fit the customers&#146; needs. There are numerous uses and applications for textile-reinforced concrete – be they architectural reinforcement and repair or in new construction. This lean, composite material in concrete construction has already demonstrated its unique qualities in numerous showcase applications – one example being the repair of a sugar silo in Uelzen using reinforcing layers as a stabilizer, the new construction of the Alphabeton AG building in Switzerland using 3D textile reinforcement made of carbon for concrete sheeting on the façade, or in the façade of the Institute for Building Materials Science at the Technical University (TU) in Dresden. Additional references, among others, are the façade of the Main Train Station in Arnheim, the stabilization of a historically protected steel-reinforced barrel roof in Zwickau and the renovation of a hyperbolic saddle roof in Schweinfurt.